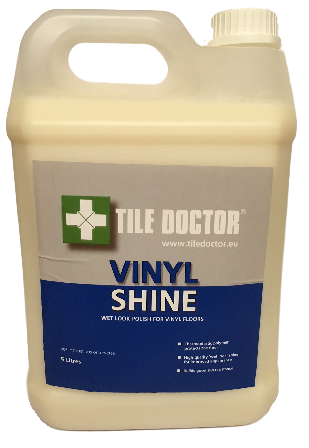 Tile Doctor Vinyl Shine is a modern high solids polymer floor seal and polish designed to protect and enhance the appearance of Vinyl floor tiles. The formula includes special polymers which produce a ‘Wet Look’ finish whilst enhancing slip-resistance. A first coat seals and protects the floor and a second produces a gloss finish. An optional third coat will give you a super high gloss finish. Tile Doctor Vinyl Shine is suitable for use on Amtico, Karndean and all other types of vinyl tiles or coverings. Suitable for use in high traffic areas such as hospital corridors and wards, schools, offices, shops, airports etc. Postage & Packing £10 (Incl.VAT) for 1 or more items.